Van Jones is probably one of the most radical czars President Obama has appointed with his direct ties to Communism, Black Nationalism, and such groups as STORM & the Apollo Alliance. The network of Van Jones by Muckety & DiscovertheNetworks.org. Here is only “some” of the information found on Van Jones over the past 4 years. With his image properly scrubbed after leaving the White House, he is now so clean as to even appear on CNN on Election night as a respectable man of government & policy. You be the judge how respectable he is. Van Jones on CNN 2012 Presidential election night, on the far right. – Van Jones sharing his insight on Republicans. – Glenn Beck boycott by advertisers was a hoax perpetuated by ColorofChange.org, Van Jones’ co-founded organization. – Van Jones at a Keynote Speech for the Power Shift ’09. Pay special attention to the parts right after minute 10 and again at minute 16 as his radical ideas become more prominent. – Van Jones finally makes a statement in regards to his signing of the 911Truth.org statement, (#46). He now said in an article by the Washington Times where he denounced the ‘911 Truther’ statement with his verified signature. He made no statement denouncing his Communist or Black Nationalist beliefs along with his more recent radical statements. Guess we’ll have to wait on that one. – Van Jones said President Bush acted like a crackhead in 2008 to the General Assembly of the Unitarian Universalist Association of Congregations. Great behavior for a White House official. – Van Jones resigned early September 6th, 2009. 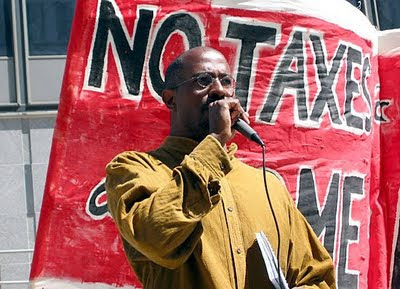 Though this is a good accomplishment for the protesters to have this radical out of the President’s Administration, it still leaves the unanswered questions of how this Communist radical rose that far in our government & how come Obama didn’t show his disagreement with Van Jones’ beliefs by terminating him from the position as Green Jobs Czar.